All The Short Ones is a month long readathon hosted by Jessica at Novel Cravings. The aim of the readathon is to read as many of your short unread books, those that are 300 pages or less, during the month of March – they can also be novellas, poetry collections, comics and graphic novels. I head of this readathon via Kristen’s Twitter when she shared her TBR and I thought it was a great way to get reading more books. I’ve nearly finished reading Hiding in Plain Sight by Nuruddin Farah so once I’ve finished that these are the books I’ll probably be picking up. At 157 pages there’s Slaughterhouse 5 by Kurt Vonnegut, a classic I’ve been meaning to read for ages, How I Came to Know Fish by Ota Pavel has 136 pages and would count towards my Read the World Project as would Nineveh by Henrietta Rose-Innes (236 pages) and The Fencing Master by Arturo Pérez-Reverte (212 pages). 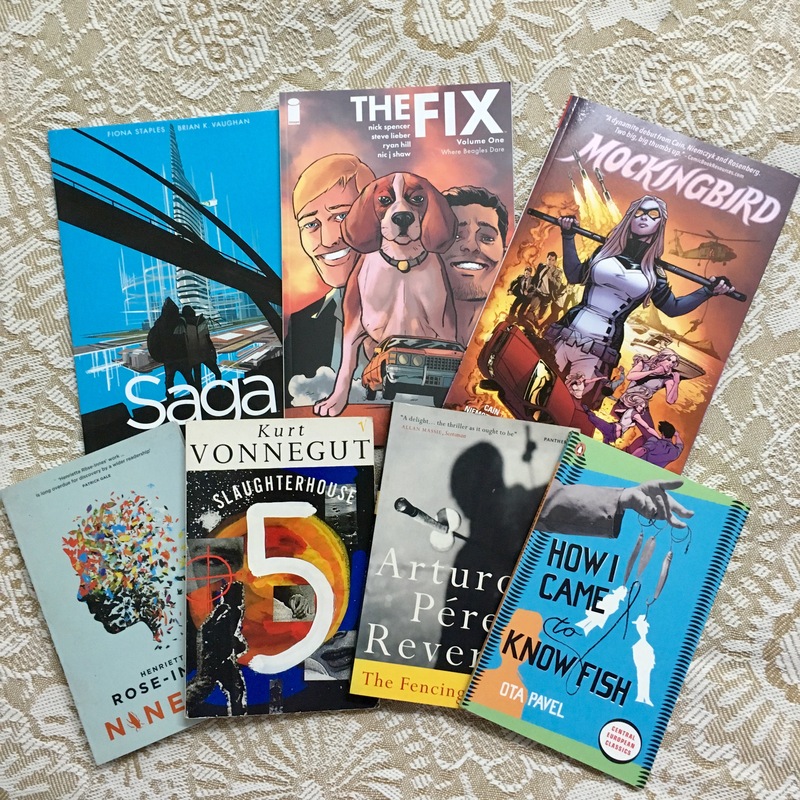 Then I have some comic trade paperbacks – Saga Volume Six by Fiona Staples and Brian K. Vaughan, Mockingbird Volume One: I Can Explain by Chelsea Cain, Kate Niemczyk and Ibrahim Moustafa and The Fix Volume One: Where Beagles Dare by Nick Spencer, Steve Lieber, Ryan Hill and Nic J Shaw. I have more unread graphic novels that I can pick up if I manage to read all these and/or fancy something a bit different. I’m looking forward to seeing how I do. My main goal is to read at least four of these but really, I’ve got near enough the whole month so that, and more, should be doable. There’s still time to sign up if you’re interested in taking part – you can do so here and sign ups close on the 7th. You can also use the hashtag #ATSOReadathon on Twitter and Instagram to see others progress and to share your own. Great post! Don’t forget you can use the hashtag to connect with other participants and share your progress. I hope I can host some sprints in the evenings next week.